I’m running out of time! Soon I won’t get to make silly food and use fun Halloween props. This makes me sad. When else can I get away with something as crazy as pumpkin shaped calzones and alcoholic punch in skull goblets? I better make the most of these two very short days. I have so many ideas on my brain-storm sheet I never got to. There is always next year I suppose, if I can remember where I put it by then! 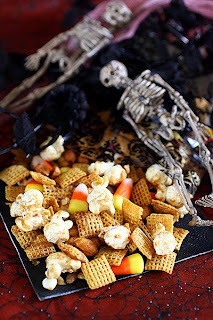 This fall style Chex Mix is heading to my daughter’s school Halloween party tomorrow. The recipe is from one of those holiday magazines that sit temptingly next to the checkout of my grocery store. I just can’t help myself, every year I buy and hoard all the Halloween publications. I become a kid again, and spend tons of time plotting out juvenile gory goodies to make during the month of October. I hope the kids will like this one. My husband was pilfering it off the tray as it was cooling, but I’m guessing 7-year-olds will be eating cupcakes long before they dig their hands into this! Speaking of which, I need to go make those. Vivarin. I need Vivarin. Or a triple shot espresso. 1 cup roasted salted pumpkin seeds (They were shelled in the picture, so I bought raw ones from the bulk isle). 1. In a 4-quart microwavable bowl, mix cereal, popcorn, cashews and pumpkin seeds; set aside. 2. In a medium microwavable bowl, microwave butter, brown sugar, corn syrup and vanilla uncovered on High about 2 minutes or until mixture is boiling; stirring after 1 minute; stir in pumpkin pie spice. Pour over cereal mixture, stirring until evenly coated. 3. Microwave 5 to 6 minutes, stirring and scraping bowl after every minute. Spread on waxed paper to cool, about 15 minutes, stirring occasionally to break up. 4. Stir in candy corn. Store in airtight container. 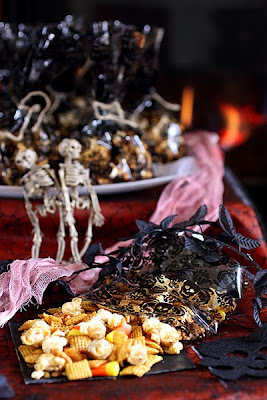 Recipe from Pillsbury’s Halloween magazine, 2009. Pictures by Laura Flowers. Espresso baby! Love the pic... the little skeletons are cute (can you say that about a skeleton?). I love the recipe name. I wish I had a bowl of monster munch right now!! I ma bestowing upon you my honorific title of Halloween Treat Queen. I will look forward to next year also. I see now that it was a series..that you do love all this! Looks great! Love this idea. Oh yum! I gotta make this tonight! I hope you like this one Linsey! oooh...I sure am liking the sounds of this snack! This looks so fun and festive, and tasty too!